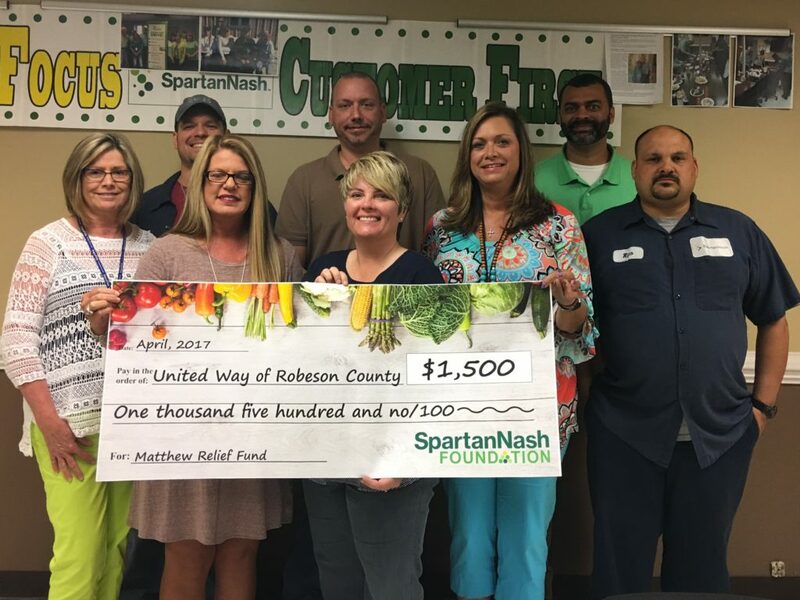 LUMBERTON, N.C. – To continue its efforts to help the residents of Robeson County recover from Hurricane Matthew and its devastation, the SpartanNash Foundation and SpartanNash’s Lumberton Distribution Center today donated $1,500 to the United Way of Robeson County and its Hurricane Matthew Relief Fund. Front row (from left): Lumberton DC Promotions Assistant Judy Walters, Shipping Assistant Samantha Walters, Latricia Freeman, Administrative Coordinator Michele Smith and Warehouse Receiving Lead Rico Jacobs. Back row (from left): Inventory Control Clerk Willie Britt, Dispatcher Derek Yost and Operations Manager Jimmy Carter. The donation was the result of a BBQ plate sale fundraiser held at SpartanNash’s Lumberton Distribution Center. By purchasing a plate of food at the Lumberton DC on March 23, associates and their friends and families raised $1,500, with all proceeds going to the United Way. In October, SpartanNash invited company associates to donate to a recovery fund benefitting Lumberton DC associates whose homes and property sustained damage during Hurricane Matthew and its aftermath. In total, SpartanNash associates – together with a company match of $10,000 – raised $26,450 to benefit their coworkers and friends. As rebuilding efforts continue, SpartanNash’s Lumberton DC associates wanted to support their local community, so they organized the BBQ fundraiser at the distribution center. “We are so appreciative to everyone who came out to support this cause that is so near and dear to our hearts,” said Administrative Coordinator Michele Smith, who organized the BBQ plate sale. Thanks to the generosity of SpartanNash vendors D&H Marketing, Motivated Sales and Franklin Baking – who donated the supplies for the BBQ fundraiser – 100 percent of proceeds were donated to the United Way of Robeson County’s Hurricane Matthew Relief Fund.